Got arachnophobia? Awesome huge scary Giant Spider has a 4.5-foot wide bent leg span and a fake fur covered polyfill body! 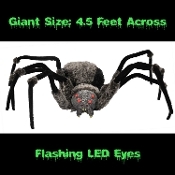 Multiple blood red flashing LED eyes light up with the flick of a switch, giving a creepy crawly menacing appearance for this super size laboratory created arachnid creature, guaranteed to scare! Hanging loop is attached to the tail end for displaying from a high location for extra spooky display, or you can place on any flat surface. Requires 2-C batteries, NOT included. Timer allows for 6 hours of operation, with automatic shutoff, if desired. Approx 54-inch (135cm) Wide. Recommended for indoor or sheltered porch use only.